When I stopped in the Two Bald Guys Audio room during the 2003 Vacuum State of the Art Conference and Show in Silverdale/Washington, I was pleasantly dumbfounded by their combination of Audio Note CD player, integrated Sun Audio SV-2A3 amplifier and Omega Speaker Systems Super 3 loudspeakers. I said in my VSAC show coverage that "... this simple and inexpensive rig had a synergy that just had to be heard to be believed. At less than $5000 for the system, this combination of kit put to shame many much more expensive setups..."
I could have sat and listened to Harry and Kent's system all day, so captivated was I by its way with the notes. I wasn't the only one captivated either: Friend and sightless 74-year young master piano restorer & tuner Bill Van Winkle bought the show pair of the 93dB-sensitive Omega Super 3s after a brief listen. That should tell you a lot. Bill's keen ears don't miss a thing and as you might imagine, Bill is much attuned to the absolute sound of live acoustic instruments. In fact, Bill's vocation depends on it. What better recommendation to check into something further could you possibly get than that? If you've been following my writings here at 6moons, you know that one of my passions is finding high performance audio gear that's both fun and affordable. I've found some doozies too, like the $39 budget wonder Sonic Impact T-Amp; the musical $800 Almarro EL84 single-ended pentode amp; the stunning $2250 Yamamoto 45 SET; or the $2995 timeless American Classic-Fi 2A3 SET monos by Don Garber. All of these products represent breakthroughs in their price ranges and offer performance that has to be considered superlative regardless of price. They are also all relatively low-powered amplifiers of 5 watts or less. When I started thinking about loudspeakers that I could recommend to go along with these low-powered wonders, my positive introduction to the Omega Super 3 loudspeakers at VSAC reared its head. When I finally geared up to actually start writing about moderately priced high-performance loudspeakers I could recommend to fellow low-powered amplifier aficionados, I contacted Louis Chochos about doing a review of the Super 3. Louis asked if I would prefer to review the fancier "R" version of the Super 3 that has "R" compound applied to the cabinet walls (a heavy asphalt & vinyl composite with talc and crystalline granules) to reduce cabinet resonance and standing waves, fancier "R' wiring, Cardas binding posts and a 2" flared port. 'Nope," said I, "I want to review the version I heard at VSAC - the standard Super 3." For stands, Louis recommended Noel Nolan's Skylan stands designed specifically for the Omega Super 3. Noel was kind enough to provide them so I could review the speakers and stands as a matched pair. Both the Omega Super 3 loudspeakers and their matching Skylan stands arrived in well thought-out packaging that protected them perfectly from the rough & tumble handling of shippers in their cross-country journey to my doorstep. The Skylan 24-inch two-column stands for the Omega Super 3 are packaged brilliantly in 3 layers. I have to say that Noel's stands are some of the most professionally packed and well-engineered audio products I have encountered. Noel should be congratulated for such a fine design, excellent packaging and easy-to-follow assembly directions. Everything you need to put the stands together is included - wrenches and a funnel for filling the stands with sand. The stands have beautifully finished wooden top plates and polymer columns. Putting the stands together is as easy as counting quarter notes: one - two - three - four. First you affix the threaded tie rods to the top plate of the stand and place the columns over the rods. Then you place the bottom plate over the tie rods and secure it with a couple of washers and nuts. Then you get to choose if you'd like three or four carpet piercing spikes. Finally you can add sand for mass loading if you wish and you're done! I then oohed and aahed over the beautiful Sapele wood finish of the Omega Super 3s. It's a magnificently grained wood with an almost translucent 3-D effect that reminds me of Hawaiian Koa (and to which the accompanying photographs don't do justice). The finish work on the review samples bested the last pair of ProAc loudspeakers I owned and which are touted as a benchmark for loudspeaker finish quality. Louis also included a bottle of The Wood Doctor furniture polish to gussy up the 3s' finish even more. The Wood Doctor polish is "An 18th century Cabinetmakers' formula of beeswax, lemon oil, and other natural oils. Preserves, protects and enriches the beauty of fine furniture." The Super 3s emitted a visible glow of pleasure as I massaged down their little 15" H x 12" W x 7.5" D cabinets with the aromatic mixture  you can't beat a hand-rubbed wood finish! You can choose between Maple, Cherry, Walnut, Sapele wood finishes, or Red Parisian Maple, Black Parisian Maple and Blue Artic laminate finishes to match your tastes and decor. The Super 3 is a single-driver crossover-less, front-ported bass-reflex speaker that uses a modified 4.5" Fostex ES full-range driver that's good for a claimed response of 58Hz - 20KHz. The cabinets are constructed of 3/4" softwood MDF with internal ladder bracing and are joined with glue in much the same way guitars are. The cabinets are veneered on all sides and use double veneers front and back. The insides of the cabinets use damping material behind the driver to suppress standing waves and back reflections that cause "frequency cancellation and distortion" says Louis. The Super 3s' insides also use what Louis calls the "Omega diffuser", a random-thrown sponge rubber damping material. The front and back baffles are of a triple-layer "semi floating" design. The front baffle houses a 2-inch port and around back there is an inset binding post bay with multi-way gold plated binding posts. The Super 3s also come with classy looking grills that you can take on and off at your whim. Louis uses a wide baffle here because he believes it "improves midrange smoothness and tonality" while giving "exceptional bass response". 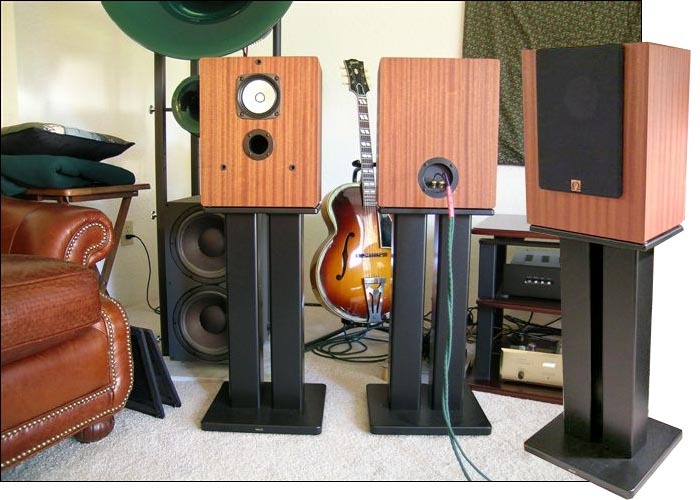 Most single driver loudspeakers are rather large Voight Pipe or rear-horn designs. Louis chose a small monitor-style bass-reflex design because he feels that "the bass reflex system has tighter, more accurate bass that goes just as low" and "is more compact and easier to place as well as lower in cost to manufacture". In simple terms, Louis believes his design gives you more sonic and musical bang for your buck. In case you haven't yet heard the mantra of the proponents of single-driver loudspeakers (SDL), I thought I'd try to cover the basics to give you a little background. The ultimate goal for a SDL designer is to cover the full frequency range of musical instruments and the human voice with just a single high performance driver. That's a difficult task to take on if you consider that the world's big pipe organs extend down into the infrasonic range below 20Hz. Theoretically speaking, you don't hear infrasonic frequencies below 20Hz as much as feel the individual vibrations that make up the infrasonic waves as they wash over your body. 10Hz infrasonic waves can even cause your internal organs to vibrate - not good. Realistically speaking, unless you're a big pipe organ fan, there's not a lot else that happens in the infrasonic range from a musical perspective. For most people, it's not worth spending too much time worrying about it. A real-world full-range loudspeaker is generally considered to be one that covers the range of human hearing - approximately 20Hz to 20KHz. To my knowledge, no single driver can cover the 20-20 range. The goal of SDL designers necessarily becomes one of capturing as much of this range as possible, using the available driver technology. The Super 3 covers the range of 58Hz to 20KHz with a single driver yet omits the low bass (20-40Hz) and part of the mid bass (40-80Hz) due to the driver's limitations. The real question I have and suspect you have as well is, "What is the sonic and musical impact of the SDL approach?"